Sharjah, November 3, 2018: Kalimat, an imprint of the UAE-based publisher Kalimat Group (KG), known for its quality Arabic children's and young adults' books, brought accomplished Emirati author, Dubai Abulhoul to the Sharjah International Book Fair (SIBF 2018) to speak at a cultural session titled ‘Culture, Youth and Literature', yesterday (Friday). Abulhoul, who wrote her first novel Galagolia: The Hidden Divination when she was 13 years old, referred to the most memorable characters in Emirati folklore as she discussed its role in igniting young people's curiosity and love for reading. She said that more books in this genre must be produced for children, as folktale characters have this wonderful quality to resonate with young minds and helps them understand the world around them better. The young Emirati author signed her new book, titled Abu Al Salasel, translated by Samar Mahfouz, and illustrated by Sara Taiba. The book is a fantasy about Abu Al Salasel, a weird red-skinned creature who is covered in metal chains. 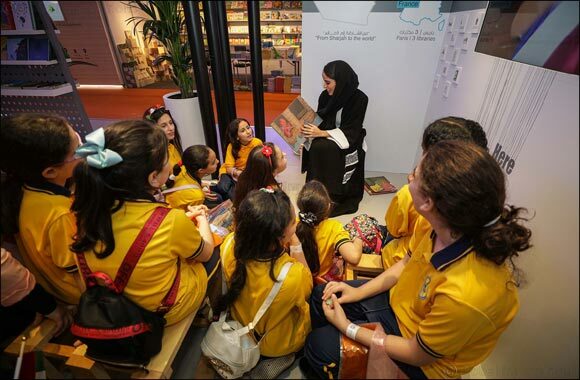 She highlighted the key role of technology in preserving Emirati folktales, and noted that it can be used innovatively to understand the changing interests and concerns of young readers. One of the best mirrors and guardians of a community's culture, and paramount to shaping national identity and a sense of belongingness among children and young adults. Dubai Abulhoul re-interprets Emirati folktales, offering new perspectives on old protagonists who were created as evil antagonists in their roles and appearances. The young author underscored that being different does not make someone evil and we should be more open to uniqueness. She highlighted that the 6-9 age group are extremely perceptive and never limit their creativity and thinking. She applauded Kalimat's cultural efforts to produce and publishing children's books centered around local folklore, saying their methods and techniques are conducive to both the rapidly changing publishing environment as well as the cultural landscape of the UAE. Abulhoul also held a reading session for children at KG's pavilion at the fair. Dubai Abulhoul was the youngest Emirati novelist to participate in the Emirates Airline Festival of Literature in 2012, and the youngest speaker at the TEDx in 2009. She graduated from New York University Abu Dhabi with a Bachelor of Arts degree in Political Science, she has a Master of Science (MSc) degree in Global Governance & Diplomacy, from the University of Oxford.